Unbeknownst--or unacknowledged--by many, there is a long tradition of psychedelic magic and religion in Western civilization. As Thomas Hatsis reveals, the discovery of the power of psychedelics and entheogens can be traced to the very first prehistoric expressions of human creativity, with a continuing lineage of psychedelic mystery traditions from antiquity through the Renaissance to the Victorian era and beyond. 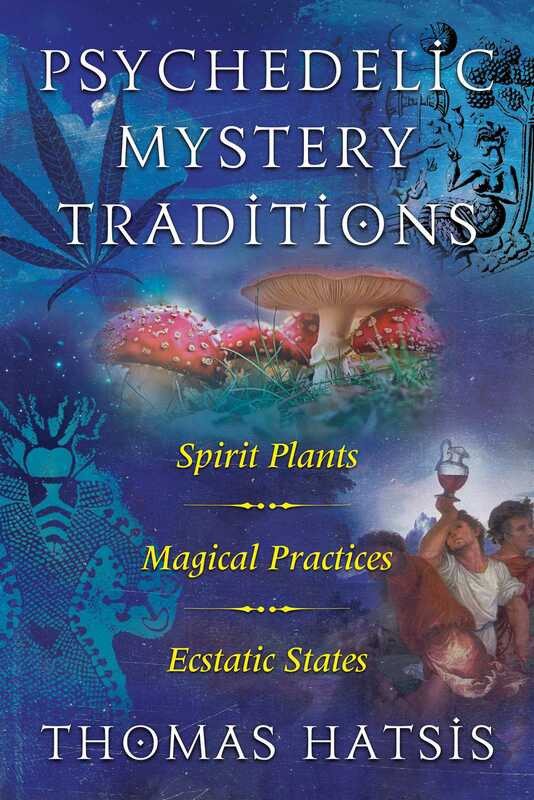 Describing how, when, and why different peoples in the Western world utilized sacred psychedelic plants, Hatsis examines the full range of magical and spiritual practices that include the ingestion of substances to achieve altered states. He discusses how psychedelics facilitated divinatory dream states for our ancient Neolithic ancestors and helped them find shamanic portals to the spirit world. Exploring the mystery religions that adopted psychedelics into their occult rites, he examines the role of entheogens in the Mysteries of Eleusis in Greece, the worship of Isis in Egypt, and the psychedelic wines and spirits that accompanied the Dionysian mysteries. The author investigates the magical mystery traditions of the Thessalian witches as well as Jewish, Roman, and Gnostic traditions. He reveals how psychedelics were integrated into pagan and Christian magical practices and demonstrates how one might employ a psychedelic agent for divination, magic, alchemy, or god and goddess invocation. He explores the use of psychedelics by Middle Eastern and medieval magicians and looks at the magical use of cannabis and opium from the Crusaders to Aleister Crowley. From ancient priestesses and Christian gnostics, to alchemists, wise-women, and Victorian magicians, Hatsis shows how psychedelic practices have been an integral part of the human experience since Neolithic times. Her lashes slowly released; every memory of the Grain Mother--stories heard in childhood; prayers she now recited over her own crops in adulthood--emanated from her mind into the sanctuary’s air, smelting with the other congregants’ visionary reverberations into a collective, luminescent vision of the Goddess. Blossoming beyond bicameral boundaries, every blink sent cool waves of inspiration through the souls of those gathered, the kind of cosmic honey we savor each time mystery gives way to epiphany; only then can we understand why the hierophants (a priest of mystery religions) sounded the gong; only then can we raise our glasses in honor of the dead. Only then does the Cosmic Graell pour forth its mystery. The divine howl of the ancestors echoed in the bones of the Eleusinian mystai (an initiate at the Rites of Eleusis). They had drunk the kykeon; they had removed the “sacred objects” (kistai) from a sacred chest; they placed the objects in a basket; they put them back into the original chest. Birth; life; death; it all made sense now. Gaia’s harvest of wheat and flesh, cosmic sickles cycling the fields of stars and galaxy clusters; likewise, an organic reaping of bones and breath. Now you are alive, now you are dead; now this universe is here, now it is gone. She recognized her part in this dance, this endless pouring forth of the Cosmic Graell into the vast seas of infinity. She was no mere spectator; she was the chalice itself, keeper of all the mysteries and miracles of conception. She was the contents as well, the waterfall of creative majesty. And in a moment her old life, which promised only fear of the ego’s termination at death, dissipated in the radiance of this ecstatic baptism. And so she danced with the other mystai. The kykeon brought the mystai into relation with Demeter; and Demeter acted as a bridge giving mortals access to the Underworld. It has been noted that the imbibing of this drink preceded the revealers’ visionary trances during the Rites of Eleusis. Therefore, academics of psychedelic history have posited that the beverage contained some kind of psychedelic pharmakon (in the ancient West, the tern pharmakon--or pharmaka, plural--included psychedelics, non-psychedelics, and even cosmetics). Indeed, the rites lasted for over two thousand years uninterrupted and bestowed more or less the same experience upon everyone. However, breaking with those contemporary scholars who see the ingredient in the kykeon as stagnant throughout the ages, I side with Amanda Noconi: that the potion contained a psychedelic, the identity of which probably changed over time, depending on what pharmakon was available. We, today, care about the proper floral or fungal identification of the kykeon because we are psychonauts living at a time when concepts like “botanical classification” are encountered as early as primary school. So we just think in that way. The ancient Greeks, to say nothing of the Mycenaean culture that predated it, held no such models. At best, they classified medicinal and psychedelic flora in magical, not botanical, terms. As I hope to demonstrate in this chapter, while the psychedelic most likely changed over time, there exists enough evidence to take a “snapshot” of a particular pharmakon, added to the kykeon, frozen in Eleusinian history. Now, it is totally possible to enter trance states without the use of a pharmakon; especially for a skilled shaman. For sure, such ancient techniques like fasting, isolation, and dancing have been used equally as long as any psychedelic to achieve higher states of awareness. However, ensuring that sometimes hundreds of celebrants at a time (who were ordinary people, not shamans) would see a vision of Persephone required some kind of prompt; something no one who drank the kykeon could have missed. Indeed, the telesterion was not outfitted for theater. Instead of the familiar series of elevating semicircles found in a Grecian theater that allows everyone in the audience to see, the telesterion featured long benches lined against the walls for the mystai to sit. In front of them, a “forest of pillars” blocked any possible view of a stage, should there have even been a stage at all. This venue is hardly conducive to a theatrical act. Furthermore, surviving receipts for the temple say nothing of actors, props, drapes, anything that would lead one to believe that the ceremony relied on a person enjoying nothing more than a staged performance. There had to be a way for each mystai to generate a vision without fail. For over two thousand years …. The theory of a psychedelic kykeon has gained acceptance by many modern ethnobotanists and scholars who no longer question if a pharmakon played a role at Eleusis, but rather ask what kind of pharmakon did the congregants imbibe? A recent debate between Ivan Valencic and Peter Webster outlines this deliberation. Valencic argues on the side of Terrance McKenna and Robert Graves that the “astonishment and ecstasy” of the kykeon, contained mushrooms; Webster, upholding the original view by Albert Hofmann, namely, that a form of ergot provided the necessary entheogenic additive. While I agree with both fellows that the kykeon was psychedelic in some way, I do not think the active ingredient was either ergot or a shroom. Or rather, I don’t think the only possibilities are ergot or a mushroom. Or rather, I think that the entheogen pantheon was such that the kykeon, at one time or another could have included ergot or a mushrooms or a variety of other plants, depending on what was available.